Yatris about to begin their journey from Chandanwari. Every morning when Bilal Ahmed 23, wakes up early morning, the only thing that is top on his mind is how to manage his customers. A resident of Naghbal in Islamabad, he owns two ponies, one managed by him and another by his brother Firdous. 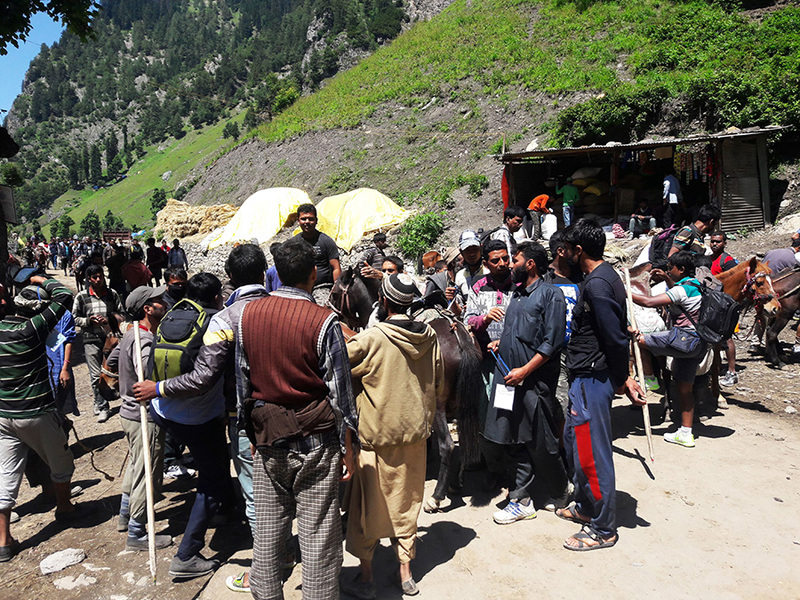 For most of the Amarnath yatra, the two brothers put up in a tent at Chandanwari. This is a yearly routine for all the service providers to pitch a tent and make it second home. Bilal shares his modest tent with his brother. It is small tent that has provisions for the mules on one side and the rest is kitchen and bed room for the two brothers. In this small colony of tents on the slopes of Chandanwari, these service providers can not afford keeping their tents unguarded. If there are two people living in a tent, one has to stay back and in certain cases they give it in custody of somebody who wants a bit of rest for a day or two. But the mornings are almost the same for everybody. After a hurried breakfast, Bilal spends almost an hour in early hour with yatris. Negotiations are usually about the rate and the service he will offer. The moot point in his negotiations is to explain how arduous and the difficult the track is. And what it means to manage a no-frills travel in a steep climb. Bilal gives his clients some time to get ready and then they leave uphill on a long climb. Pissu Top is the next first destination on the route to the cave. This point is very crucial for both the sides. Hindu pilgrims drive to this place with friends, relatives and colleagues, usually in secured convoys from Jammu. Though they are in J&K for many days but it is here they are literally with Kashmir, its environment, its people. This point is their first formal introduction to Kashmir. Literally, the conversation starts here. These are two different people, separated by faith, culture, language and a huge decadal suspicion created by conflict and politics, media and the politician. But talking is human, so they talk. Normally, the conversation starts with the introduction, then it moves to family, goes around education and ultimately ends with Kashmir’s current situation. 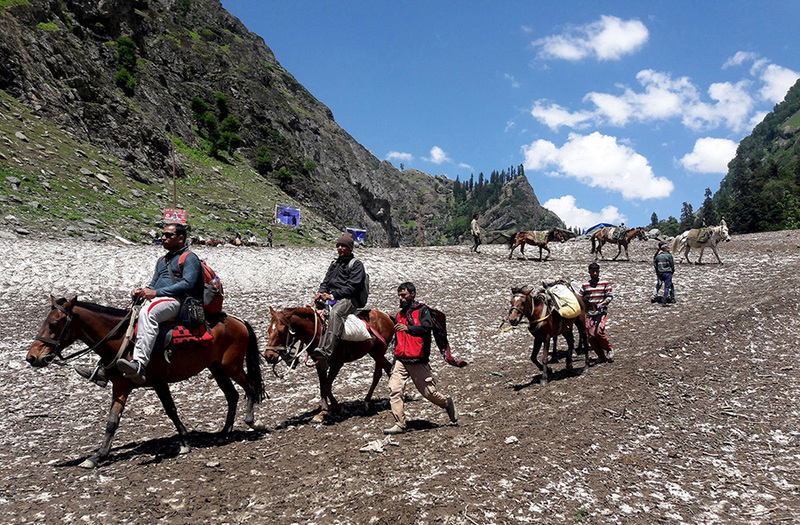 “When I had my first trip of the this season with two pilgrims from Gujarat, the first stop was Pishu Top, three kilometers of uphill’s trek after Chandanwari. Nothing much happened on this track. Then they stopped for some cold drinks, for which they went to a lunghar, the community kitchen. Since lunghars are exclusively for pilgrims, Bilal used this break to serve his pony with hay and corn, which every pony walla carries with himself. By then, a comfort level had reached between the horseman and the pilgrim. As they resumed the travel, pilgrim asked: why are you running a pony instead of studying? ”My father is aged and remains unwell so as the next elder, it’s my responsibility to earn for my family,” Bilal remembers his reply. Bilal first giggled after being called a Baiyah by the granny-looking pilgrim, over 55 year old. Then he had a long pause. “Theek Hi Toh Hai,” he responded. “But why are you asking this?” It was this conversation that continued till they reached Sangam, the last stop on the track. Almost educated on what is happening in Kashmir and why, when Bilal got them back, they discussed many things: politics, leadership in Kashmir, business and lot many things. Some of them end up making friends and in certain cases they do not look at each other’s face when they depart. But it all depends how the two talk and accommodate each other in the conversation. Bashir Ahmed 45, is from Aishmuqam. He is a pony walla for around 20 years. He owns three ponies and has employed two boys to manage his two animals. He usually keeps his boys with him and manages the clients personally by fixing rates and other things. “I always had blended experiences with yatries every year, and one needs an art to build up a rapport with his customers,” Bashir said. Almost three years back, Bashir remembers, his customers were from Karnataka. The conservation started, as usual, with the introduction. Then, Bashir asked them about their work, their families and offered them a detailed narrative of what he does when the yatra is over in anticipation of it. Those words, Bashir says, still reverberate in his mind. “I felt at least they respect our hard work know,” he insisted. Last year, Bashir had a young pilgrim from Delhi who during the travel discussed the current situation and youth of the valley. He said he talks very cautiously because there is no conversation, if you hurt the other. “As everyone knows the cause of the Kashmir conflict, customers may feel bad if you discuss something which may malign their nation or their people,” Bashir said, insisting every single word. A pithuwala (one carrying luggage, usually on his back) in his forties from Kulgam said he had an interesting experience. Managing his work in the yatra stations, once, he met a pilgrim at Sheshnag. Given the fact that the communication with people is an art that people learn gradually, some of the ponywallas face interesting situations. Bilal’s younger brother is an interesting instance. He minces no words and tries to be honest with in conversations regardless of whether it suits the audience or not. Abdul Hameed Wani, is a Ponywalla from Salia Brade area, for the last 16 years. He has an impression that the people running community kitchens and the soldiers deployed on the security interrupt and sometimes add to their problems. Various others said that even the Shrine Board contributes negatively. While the labour permit is supposed to be issued to a labourer on the trek for Rs 50, as fixed by the Shrine Board, it is available for Rs 150. For the animals employed on the job, the medicines at the veterinary points are supposed to be available at half the costs, but it never happens, they alleged. Over the years, these service providers say the rates have gone down. 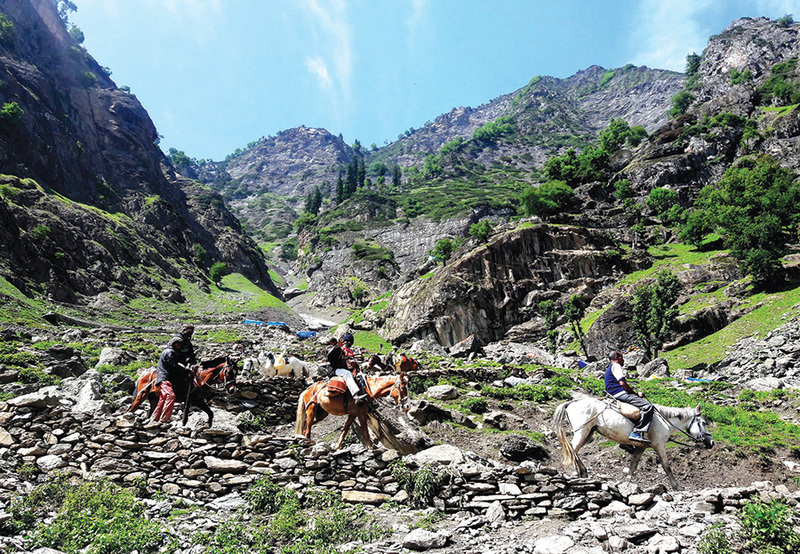 “Once I used to earn Rs 8000 for three days between Chandanwari to the cave and return, now I hardly make even half of it,” Bashir Ahmad said. “As earnings have gone down, the expenditures have increased.” Shrine Board has fixed a rate of Rs 5,500 per head for ponywalla between Chandanwari and the cave, but it is quite rare that people make half if it per turn. But the tradition survives strong with every passing year.